The leader of Venezuela's opposition — and the man who now claims the presidency — was relatively unknown even in his own country when he was thrust into the international limelight. But Juan Guaido tells CBC that despite the risks that come with taking on President Nicolas Maduro, he's not backing down. The leader of Venezuela's opposition — and the man who now claims the presidency — was relatively unknown even in his own country when he was thrust into the international limelight. 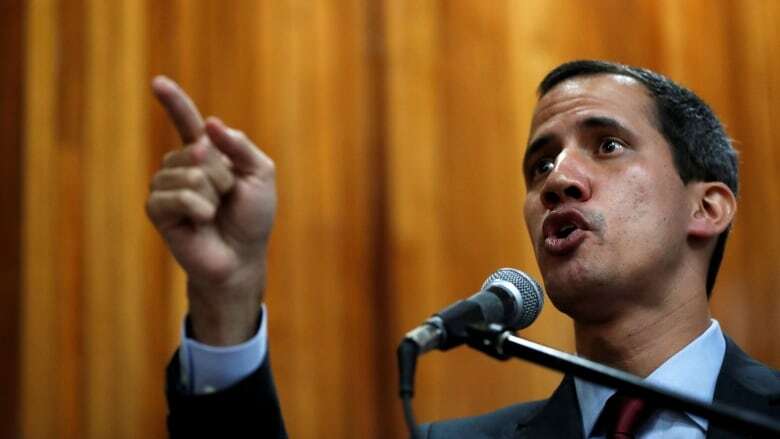 But Juan Guaido says that despite the risks that come with taking on President Nicolas Maduro, he's not backing down. Guiado was at his alma mater, Andres Bello Catholic University, on Wednesday to speak to a group of farmers about improving the country's food supply. The engineer by training has become a high-profile politician, trailed by journalists, admirers and selfie-hunters. As he ducked into a building at the school in Caracas, he ran into what appeared to be an old friend. The two embraced, and the friend looked at him with wonder. "You're a rock star," the friend told him. 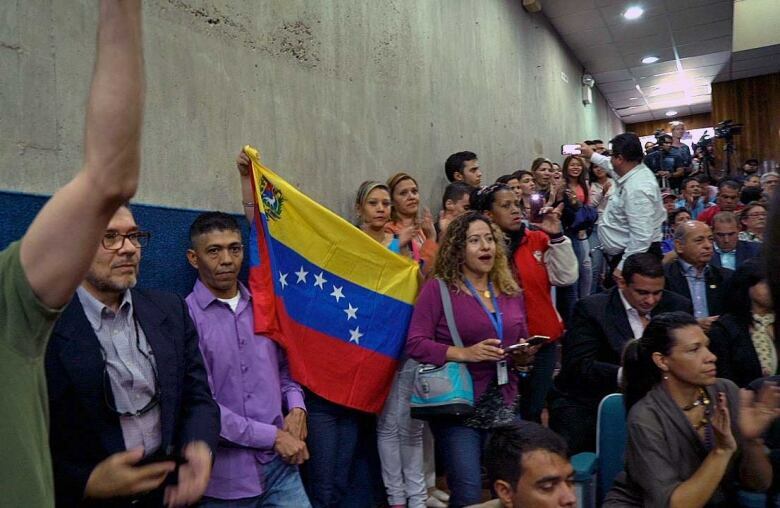 There is, indeed, a certain Obama-like quality about Guaido, something his supporters seem to sense, breaking out into shouts of "Si, se puede" ("Yes, we can") when he enters the auditorium — although the populist rallying cry predates both Guaido and Obama by several decades. ​To his opponents, the newly prominent politician is a usurper trying to oust the country's elected president. To his supporters, he's a voice for the people in a country beset by chaos and corruption. Guaido's swearing-in of himself as interim president on Jan. 23 has energized this country's opposition in a way that nothing has before, but he didn't arrive in this position simply through charisma. Instead, a series of first partisan and then constitutional factors pushed the relatively unknown politician into the forefront of a movement that derives its main force not from him but from the desperation for change of millions of Venezuelans. One of the first people to speak in the university auditorium reminded him of that when she turned to him during a speech and said: "Don't let us down." As Guaido received plaudits from his backers Wednesday, he also heard from Diosdado Cabello, a prominent member of Maduro's government. "Mr. Guaido, you haven't heard the whistle of a bullet near you, you hear?" Cabello said. "You don't know how it feels to have a bullet hit three centimetres from your head." "Lamentably, the Venezuelan people have had to listen to a lot of whistling in these years," he said in an interview with CBC News. "We're not going anywhere. We're not afraid." 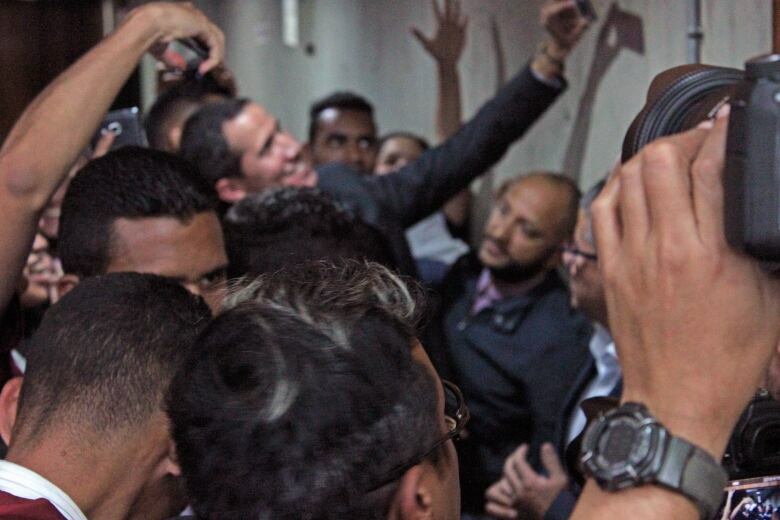 Guaido moves freely, with only three visible bodyguards, constantly surrounded by crowds. There is no effort to separate him from anyone. At one street rally, he departed by hopping on the back of someone's motorbike for a ride to the next event. Guaido has already been shot by government forces, having been struck by pellets from a 12-gauge shotgun in the neck and back during protests in 2017 in his home state of Vargas. Back then, Maria G Hernandez Del Castillo, a deputy in the National Assembly, tweeted a photo of his injury. Agents of the government's feared secret police arrested him briefly in January but then let him go. He hasn't been touched since. Why not? "That's a great question. I've asked myself the same one," he told CBC News. "Especially because there are more than 350 political prisoners, and we have politicians who have been murdered, tortured, exiled, kidnapped, among other things." Guaido said he sees three main reasons he hasn't been detained. "The first is we are acting in keeping with our constitution. And that is the first element, so the world can see our actions are completely constitutional. The second is the support of the people. "And the third one is the support of the international community." That support has come in various forms. Some countries, including Canada and most of Latin America, recognized Guaido within hours of his declaration that he was assuming the role of acting president under the Venezuelan constitution. But those countries have also ruled out any kind of foreign military action. Most major European nations, who also believe Maduro is not a legitimately elected president, gave the Venezuelan leader eight days to call new elections — and then recognized Guaido when he failed to do so. They also oppose foreign military intervention. But one government, the Trump administration, has repeatedly refused to say that military involvement is out of the question. WATCH: Juan Guaido talks about support from Trump. "I thank President Trump for the firmness and determination with which he's spoken about Venezuela," Guaido said, going on to thank Prime Minister Justin Trudeau and other international leaders. That international support has been contentious both within Venezuela and abroad, as some question whether countries like Canada should be weighing in on leadership issues in sovereign nations. Guaido said Maduro's government wants the people to believe that the demands for change are sponsored by the U.S., rather than driven by Venezuelans. "The Venezuelan struggle has been years of sacrifice. The construction of a majority, mobilization, non-violent struggle, social and political demands — many elements," he said. "To reduce it to a question of outside pressure from one country or another would be to minimize our struggle. And our determination to be free." As the country deals with the competing claims to power, there are questions around who will make decisions that affect the lives of poverty-stricken Venezuelans. Countries have given money for humanitarian aid to be administered by Guaido, but Maduro has sworn that no cargo will pass. 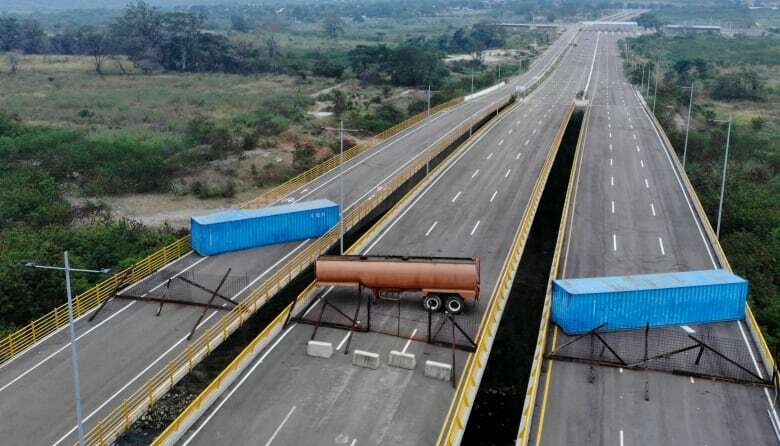 Just hours before CBC News spoke with Guaido, Venezuelan troops dropped off shipping containers and a tanker trailer at the Tienditas Bridge, further blockading an unused border crossing between Colombia and the Venezuelan town of Pedro Maria Urena. The multi-lane bridge was completed in 2016 but never put into use as tensions escalated between the two countries. In the recent crisis, there's been a push, primarily by the U.S., to have it serve as the principal corridor for foreign aid into Venezuela. 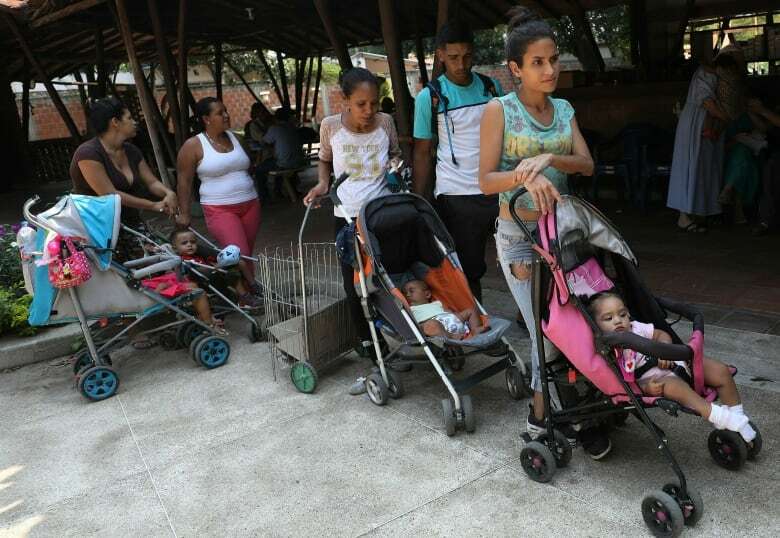 There is anger in Venezuela at the thought that the government would prevent aid from reaching needy people, and that means pressure on Guaido to make it happen. But not one square inch of this country is under Guaido's control, and the military remains the mainstay of the Maduro government. "Part of our work is going to be to convince military members and generate political pressure on them as Venezuelan citizens who also have mothers who are sick, who also have family members in need," he said. "That they have to take care of their families. Not only appealing to their conscience and respect for the constitution. "We are going to insist with a lot of force that the entry of aid saves lives in Venezuela." Back at the Caracas university, farmers from across the country participated in a meeting of the national farming and livestock associations. Coffee growers from Portuguesa State, orange growers from Yaracuy and ranchers from the vast plains around the Orinoco gave speeches that boiled with anger at a government they say has destroyed the Venezuelan countryside, and their ability to feed the nation. "This government persecutes the coffee growers," said one woman, relating how productive coffee farms had been reduced to growing subsistence vegetables. Farmers spoke about millions of doses of foot-and-mouth disease vaccine they had brought privately being stranded in Brazil because the government won't let them enter the country. One man said police had broken up a meeting in his town and arrested 30 farmers, accusing them of subversion. "We were just talking about how to solve foot-and-mouth because that's our work," he said. "We weren't there to overthrow the government." The opposition leader, who is pushing forward despite the lack of a clear path, told them he would work with them to restore the countryside. "It's clear to me you understand your role in helping to recover our country," said Guaido, whose own role remains in flux.